I seldom have interest in watching animated films, including Pixar and Disney releases, but this movie piqued my interest because of its subject matter: retro video games. Although it could be seen as a kids movie, I think it’s made specifically for two demographics: adults my age who grew up playing Nintendo and Sega Genesis, and kids. The video game villain Ralph, voiced by John C. Reilly, has a conscience and is sick of being looked down upon. The protagonist in his game (“Fix-It Felix”) is showered with accolades by the society of people living within the Wreck-It Ralph game while everyone looks down on Ralph (he sleeps on a mountain of garbage). To earn the respect and admiration of his peers, he leaves his game and ventures into other games in the arcade to prove his mettle and return to Wreck-It Ralph a “good guy”. While Ralph adventures through other games he runs into classic video game characters including Sonic the Hedgehog and Dr. Robotnik, Bowser, Kano from Mortal Kombat, and Ken & Ryu from Street Fighter, among others. I tend to avoid animated movies of this type because they rarely break through the kids-movie-formula that the niche is known for, although there are some notable exceptions like the fantastic Wall-E. While Wreck-It Ralph probably doesn’t rise to that level of excellence, it lovingly and faithfully represents several decades of video game culture. The three-dimensional sets, scenes, and animations in this movie are stunning, and are interspersed with gloriously accurate 8-bit segues – the $165 million budget practically ensured sky-high production values. When Ralph is in a bar called Tappers (a reference to a 1983 arcade game called Tapper), the bartender excuses himself to serve patrons and the audience watches 3 seconds of actual Tapper gameplay footage in fast-forward before the character returns to resume dialogue with Ralph. This cross-cutting of film and vintage game scenes is done to hilarious effect. 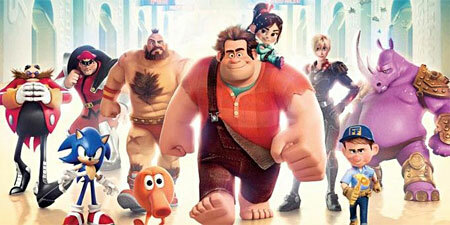 John C. Reilly (frequent Will Ferrell collaborator) voices Ralph fantastically. Simply great casting. What I didn’t like was 30-minutes that took place inside the “Sugar Rush” game, which is a racing game set in a Candyland-like world. This fictional game doesn’t seem to even be a reference to any actual game, which is disappointing. Not only that but Sugar Rush looks like a game for 3-year-olds, which is underwhelming after Ralph ventures through some very familiar landscapes of gaming to great nostalgic effect. The character which is native to Sugar Rush (voiced by Sarah Silverman), is also annoying and obnoxious, like a bratty child. 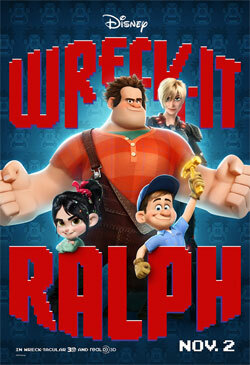 Despite these small shortcomings, I really enjoyed Wreck-It Ralph, and it easily exceeded my expectations.